Two Black Swans from Asia: What Are Their Global Consequences? Low Probability High Impact (LPHI) events are rising significantly in the last few months and the latest two such events from Asia could have unpredictable consequences for global stability. 1. When China catches a nasty cold what happens next? 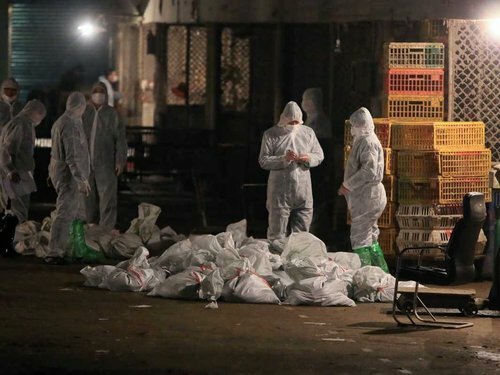 China's outbreak of bird flu, type H7N9, has killed 6 out of 21 confirmed human cases since March and led to a mass cull of poultry and closure of wet markets in Shanghai and other eastern cities. All confirmed cases of H7N9 have been in eastern China: Shanghai, Zhejiang, Jiangsu and Anhui provinces. No connection has yet been established between the virus and dead pigs found floating in a Shanghai river with bird flu earlier. China's National Center for Food Safety Risk Assessment has warned the public against touching or eating sick or dead poultry and to cook eggs and poultry products thoroughly. Chinese health authorities have notified the Geneva-based World Health Organisation (WHO) of an additional three laboratory-confirmed cases of human infection. H7N9 has some of the genetic hallmarks of an easily transmissible virus according to Prof Ron Fouchier of the Netherlands who is specialised in molecular virology. He originally showed how H5N1 avian flu could become airborne. More than 600 people have been infected with the H5N1 bird flu strain since 2003, and almost 60 percent have died, according to the WHO. The spread of a lethal infectious pandemic is very bad for business, as East Asia discovered during the SARS outbreak in 2003. China, Hong Kong and Taiwan financial markets are soft -- more down than up -- as a result of this latest strain of bird flu. Air China, the nation’s biggest carrier by market value, fell as much as 8.4 percent in Shanghai trading in one day. China Southern Airlines dropped as much as 6.8 percent and China Eastern Airlines declined as much as 5.2 percent. Many Hong Kong and Taiwanese companies are heavily exposed to mainland China risk: from airlines and food makers to electronics manufacturers. One of the People's Liberation Army's (PLA) senior officer's is blaming the US military for this bird flu virus. Dai Xu, an air-force colonel, with a mass social media following, wrote on his micro-blog that the new virus was another "bio-psychological" weapon and that China should deal calmly with the problem and not be swayed by this latest US trickery. What are the consequences of this mainstream anti-US propaganda in China? Let us remember that previous global pandemic scares associated with bird flu viruses have failed to materialise and benefited the pharmaceutical companies more than anybody else. A few members of the PLA do not necessarily equate to an official opinion, however it is important to note that the possibility of a bird flu pandemic originating from mainland China now needs to be monitored very carefully and the complex situation could escalate significantly. 2. Will the Bank of Japan trigger an accidental avalanche in Japan's credit rating, JGBs and the yen's value? The Bank of Japan (BoJ) plans to nearly double its monetary base over the next two years. If the printing of money or Quantitative Easing (QE) by major central banks, such as the BoJ, is going to go on forever in the medium term, does it mean a permanent bull market in equities and commodities? Which type of cascading black swans could emerge as we go into turbo QE courtesy of the BoJ? If Japan’s Nikkei has risen 6.7 percent and the yen has declined 5.6 percent since the BoJ announced on April 4th that it would double bond buying to reach its target of 2 percent annual inflation within two years, what's the currency risk? What happens if there is a loss of confidence in the Japanese yen and there is an avalanche of losses in the yen's international role as a reserve currency, which becomes irreversible for the BoJ? Another area of concern is Japan's level of national debt to GDP ratio, which as a result of this new turbo QE is likely to cross 350% and more. What happens to the credit rating of Japan? Could Japan’s turbo QE programme force large domestic and international investors away from Japanese Government Bonds or JGBs into other higher-yielding securities outside of the country, including US treasuries? As a result, JGBs could lose significant value and so interest rates may tick up, up and away in Japan? Could such a scenario suddenly plunge Japan into another type of financial crisis altogether? Finally, at which point does turbo QE backfire? When do we see a Zimbabwe like hyperinflation situation? What are the tell tale signs of such an event happening in the context of Japan and other industrialised nations experimenting with QE? Remember the hyperinflation lessons from the Weimar Republic in the early 1920s in Germany and how fast that QE experiment escalated beyond a critical point? What are the consequences of BoJ's turbo QE for the rest of the world? Will Japan be salvaged or ruined by the BoJ's turbo QE? Japan's equity market is up 36% year-on-year, making it the best global performer amongst major economies? The Nikkei has crossed 13,150 for the first time since July 2008. We might be about to witness 100 Japanese yen to the US dollar -- presently 98.5 yen -- again on a consistent basis for the first time since the 1990s. The IMF has weighed in to say that all this is good news for global growth. However, will the G8 and the G20 -- and particularly China, India and Brazil -- tolerate such a massive devaluation of the Japanese yen and isn't this another phase in a large scale global currency war in which competitive devaluation is the key strategic play? What does such an aggressive phase in the global currency war portend and does it lead to a trade war? What are the consequences and primarily for whom? Are we witnessing a repeat of the late 1930s "beggar-thy-neighbour" policies once again? If so, what happens in the 1940s repeat sequence in the 21st century? Let us not forget that China and Japan are already at loggerheads with each other over disputed territories and North Korea is exceedingly belligerent with every passing day. Asia-Pacific appears to be more volatile today than it was prior to Pearl Harbour in 1941.